When I have flashbacks of the long ago days when almost any rich delicious food was a comfort food for me, I also remember the aches and pains and how hard it was to get around when I weighed over 300 pounds. I am always on the outlook for healthy, delicious, and nutritious foods. At Thanksgiving my sister-in-law, Cherrie Thomas, served me one that I came right home and have fixed several times. She had sliced yams into quarter-inch slices and then put them on an oiled cookie sheet with just a little butter (I use a little olive oil) and roasted them in the oven. WOW they tasted like a vegetable candy. Like anything else, portion control is key, so I limit a serving to ½ cup per serving. The most popular New Year’s resolve is to lose weight. Here are a few of my favorite. Pomegranate and Grape Nuts: I always have an apple when I have a bowl of whole grain cereal in the morning. One day I was out of apples and decided that pomegranates would do. I had ½ cup of Grape Nuts with 1 cup of pomegranates ales and 1 cup of soy milk. It was so good I think I have had it every day for the past two weeks. Frozen fruit shake: Ice cream custard was one of my favorites long ago so I had to find a shake that would take its place and satisfy my craving for my old shake. I now buy a bunch of bananas in the store and let them sit on the counter until they get a few little dark brown dots on them. At this point they are ripe and the sugar in the banana is fully developed. I then cut them into 2 inch slices and put them on a cookie sheet covered with plastic wrap and freeze them. When I am ready for my special treat, I put a frozen banana into the blender with 1 to 1 ½ cups of vanilla soy milk or milk. Add just a few drops of vanilla and turn the blender on. 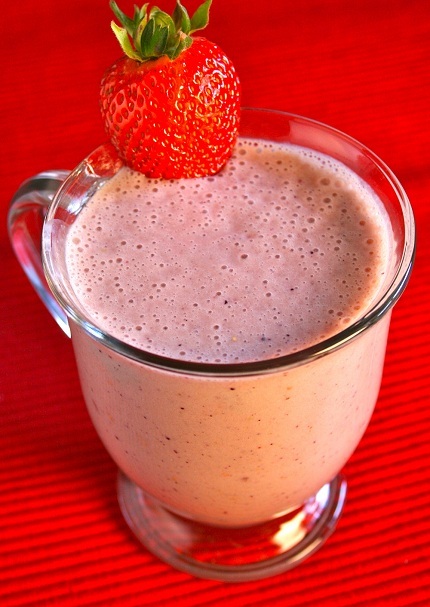 Frozen strawberries and other fruit are wonderful to add to the basic banana. Smoked salmon sandwich: Buy thin sliced smoked salmon and no-fat cream cheese. Toast a slice of whole grain bread and then spread 1 tablespoon of cream cheese over it and then place 2 oz. of the thinly slice salmon on top. Hearty chicken salad: First I put in the romaine lettuce then add yellow and red peppers. I then added some grapes and pomegranates along with some roasted butternut squash that has been warmed. Add 3 oz. of cooked chicken breast and a little of Newman’s Own Lite Sesame Ginger Dressing.